The Solar Flock represents a bird flock bathing in the sun, ruffling their feathers. 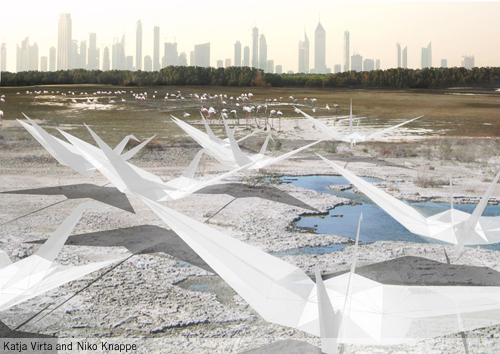 The Solar Flock acts as a middle ground between the built landscape and internationally acknowledged Ras Al Khor wetlands area, between the human ecologies and the natural habitats of diverse species. Solar panels are arranged in a form that resembles folded paper birds. It makes a reference to ancient wisdom, art, nature, science and even building. Instead of the high tech esthetics often employed in solar energy installations, the Solar Flock has a very simple and lean esthetic quality. 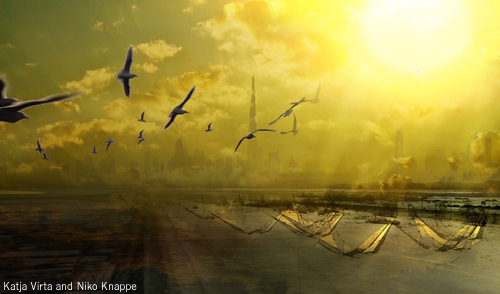 The flock of solar birds, bathing in the hot sun, signals the environmentally conscious efforts of Dubai in environmental protection and creation of ecological human habitats. This array of human made nature is surrounded by huge building projects like Lagoon, Business District and Dubai culture district. The Flock acts as a landmark of Ras al Khor, and as a reminder of the wild nature. Birds are constructed of three dimensional planes that have larger solar area efficiency compared to regular plane mounting. Large enough areas are used with thin semi transparent solar photovoltaics where as other planes act as a light reflecting and strengthening material. The alignment of birds is designed according to sun trajectory and wings follow the sun by simple 1-axis movement. Light sensors on bird heads will detect sun angle and direction. One energy storage unit connects all birds and stores enough energy to light up birds during the dark, distributing the rest to the grid during the day. The darker it gets, the brighter the birds will become. The Solar Flock installation is scalable, so that the flock can grow larger when needed. Also the type of birds can be varied, or more efficient species can be installed over time, according to the development of solar technology. Birds are constructed around metal frames, that are sturdy enough to survive high wind & storm conditions. Surface material is semi transparent reflective photovoltaic thin film that let’s decorative LED lighting pass trough. System uses well known and tested photovoltaic based renewable energy production. The installation profile is fairly low, so it leaves the views open to the shore. There are no visible technical installations needed, the electrical mains can be hidden underground. Cabling goes inside the ground through birds’ legs all the way to the energy storing unit.